For many, a new year means a fresh start, which includes plenty of resolutions that you may or may not keep. We’re all familiar with the busy start to the year in the gym only to see the masses start to shrink by the end of January. By end of March the regular crowd is all that is left. Don’t run your marketing strategy in the same way. Set marketing resolutions for 2018 that you can keep and that will set you up for success in the upcoming year. 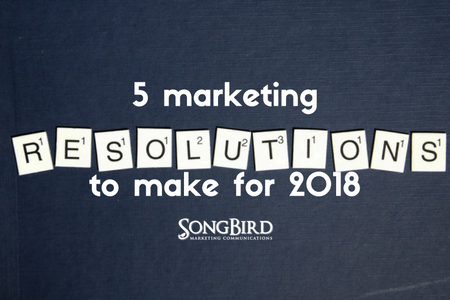 Here are 5 marketing resolutions you should consider for 2018. OK, this one is a bit of cheating when it comes to New Year’s resolutions because you need to start before the year begins. We’re including it here anyhow! You owe it to your brand to get things done in a timely manner, and, when it comes to your marketing, that usually means starting early. Don’t wait until January or February to start planning for the year. December is usually a bit less busy, and that is a perfect time to think ahead. Schedule a few strategy sessions with your team (or on your own!) before you shut down for the holidays. Really get into the nitty-gritty details of what 2018 will look like so you can get started right away in January. Build a solid strategic foundation by figuring out what’s working and what’s not. If something isn’t working, set it aside. You can always revisit a strategy at a later date if the timing is better. By eliminating tactics that don’t work you’re freeing up resources (time and money) to invest in other tactics. It’s really easy to get stuck in a marketing rut. You choose the easy path, what you know, and you stick to it, even if it’s not working for you. Before you know it, a year or two has passed by – maybe even longer – and your business hasn’t grown. You need to step outside of your comfort zone to push yourself further. This will also help to create new touchpoints for your customers to experience your brand. For example, if you have focused a lot of your energy on social media and digital marketing tactics, try something experiential to hit a targeted geographical group. It’s never too late to start listening to what your audience actually wants. Spend 2018 getting constructive feedback from your target audience. If you build audience listening into your overall strategy, you’ll be able to collect the data fairly easily. Your audience will also get used to the types of conversation where they can openly give feedback that they know isn’t falling on deaf ears. This will show them that you care about them. Many businesses get their website together and then they never think about it again until they are forced to create a new one because it is terribly outdated. You should regularly update your website content. Make a point to schedule regular website updates throughout 2018. Whether you tweak things monthly or quarterly, you’re ensuring a fresh experience for your customers. Marketing resolutions don’t have to break the bank, nor do they have to be overly time-consuming. But if you focus on the right areas in 2018, you will see results that you can be happy with.